Appreciate wildlife such as this moose from a distance to avoid risk of injury. Photo by Philippe Henry. At the National Wildlife Federation, we’re often asked by the media for advice on how to avoid getting attacked by wild animals. While sensationalist stories of wildlife attacks are popular clickbait and while we’d prefer questions about how people can join our mission to protect wildlife and ensure it thrives in a rapidly changing world, attacks on humans do occur on rare occasions, so we want to share some advice on minimizing the chances of that happening. The only foolproof way to avoid the chance of a wildlife attack is to never step foot outside. That, of course, would be an unfortunate overreaction, especially when you consider that statistically speaking you are in exponentially more danger from things like driving your car, going outside when it’s raining and getting struck by lightning, or from going to the hospital and picking up a fatal infection than you are from wildlife. Most people don’t avoid driving, going outside when it rains or going to the hospital when you’re sick, even though these are comparatively risky behaviors, so why avoid time in the outdoors? Never try to touch, feed or get even remotely close to a wild animal (yes, that means no selfies with wildlife). 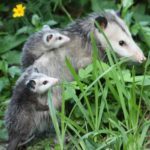 Read up on the wildlife that lives wherever you’re going so you’re aware of what species you might encounter, what signs to look or listen for to alert you to the presence of wildlife, and how to recognize aggressive behavior. Be aware of your surroundings when you’re in wildlife territory. Seeing wildlife is one of the most exciting things about heading outside into nature. Just enjoy it from distance. Here are our tips to avoid conflict with a few of North America’s larger wildlife species. Ignore this advice at your peril, unless you want to earn a Darwin Award. Black bear photo by Steve Perry. Black bears are found over much of North America, including suburban areas. They are naturally afraid of people and typically run from us. If you’re hiking out in bear country periodically makes some loud noise and that usually does the trick to keep black bears away. If you’re camping, store food in bear-proof containers or hang it high up in a tree. If black bears live in your neighborhood, don’t feed them, either directly or indirectly. Keep trash indoors until the morning of collection, don’t leave pet food outside and take bird feeders down if bears are feeding from them. The only time black bears are dangerous is when they’ve lost their natural fear of people because we’ve fed them. If you see a black bear that doesn’t immediately run, shout at it and clap loudly and it will usually flee. Carry bear spray if you’re out in wilderness areas as an extra precaution. Learn more about black bears. American alligator photo by Bonnie Masdeu. It should go without saying that getting close to a predatory reptile that can grow to thirteen feet long and has a bite force of over 2,000 lbs. per square inch is a bad idea. Alligators are found in coastal wetland areas from North Carolina south throughout Florida, and west into Texas. Avoid swimming in areas where alligators are found, especially at dawn, dusk or nighttime when the reptiles are most active. As with black bears, never feed alligators, which causes them to associate humans with food—a recipe for disaster. Mountain lion photo by Kimberli Robberson. Of all North American predators, mountain lions (also known as cougars, pumas or panthers) are the only one to occasionally perceive humans as potential food. That said, attacks on humans are incredibly rare. Found in the west, mountain lions normally prey on deer but also take smaller prey such as raccoons, rabbits, birds and coyote. If you’re hiking, camping, canoeing or cycling in mountain lion country, it’s best to go with a buddy because a lone person is more likely to attract interest. If you do encounter a mountain lion, don’t run from it or turn your back on it. Like our pet cats, mountain lions will instinctually chase anything that runs and are triggered to stalk potential prey from behind. Instead, as with black bears, shout at the cat, clap loudly and spread your jacket over your head to make yourself look larger to scare it away. Learn more about mountain lions. Moose photo by William Wiley. Although not predators, moose are the most dangerous animals on this list. The largest species of deer in the world, moose can stand six feet at the shoulder and weigh over 1,000 lbs. As with most wildlife, moose generally flee from people, but if you surprise one and it feels it cannot get away, it will go on the defensive and attack. Though the males sport huge antlers, a moose’s main defense is its hooves. One kick from moose can be fatal—and if one attacks it will use its front legs to pound the perceived threat repeatedly. Males are particularly aggressive during the fall rut, and in spring and summer females with calves with not hesitate to decimate you. If hiking in moose country, just keep your eyes peeled for these massive deer and if you see one quietly move away from the area.